This is the scene as the transmitting antenna for KRLD-TV is about to be hoisted to the top of the tower (at Griffin and San Jacinto). 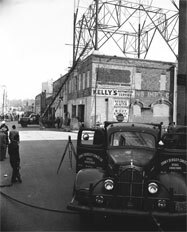 The exact date of this event is unknown, but I can tell you that KRLD-TV signed on, using this antenna, on December 3, 1949. And it must have been late in the year when this picture was taken, because everybody's dressed for cool weather. As part of the station's 60th anniversary celebration, Fox 4 reporter Richard Ray mentioned on 11/29/2009 that the original KRLD-TV tower on Griffin St. was the tallest television tower in the world when the station went on the air. So the installation of this transmitting antenna was a history-making event. 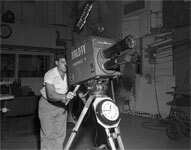 It should be noted, however, that experimental TV broadcasts from the Empire State Building in New York were on the air as long ago as December 22, 1931, broadcasting ultra-low resolution pictures. 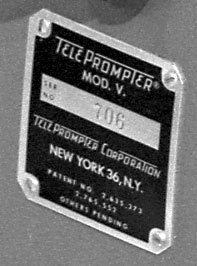 TV pictures using the standard 525-line format were broadcast from the Empire State Building beginning on July 1, 1941* -- on the old TV Channel 1, which was later deleted. The Empire State Building is about 2½ times as tall as the KRLD-TV tower, although it is still quite possible that the KRLD-TV tower was the tallest tower (at the time) built specifically for television transmissions. 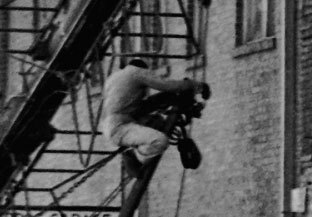 You may also notice that quite a crowd had gathered to watch, not because they're eager for television programs to start, but rather, I suspect, because the steeplejack does not appear to be wearing any safety equipment other than perhaps a hard hat. No doubt some of the men in the crowd were wondering what "television" was. 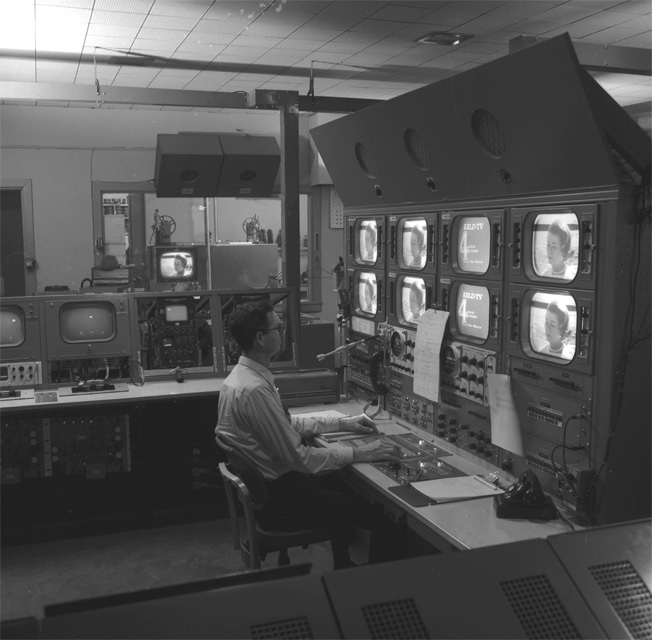 It was generally described back then as a way to watch movies over the radio. 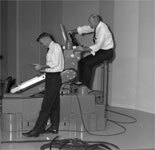 If the men in this crowd had been able to see into the future and watch a few episodes of today's TV programs, they might have burned the station down! 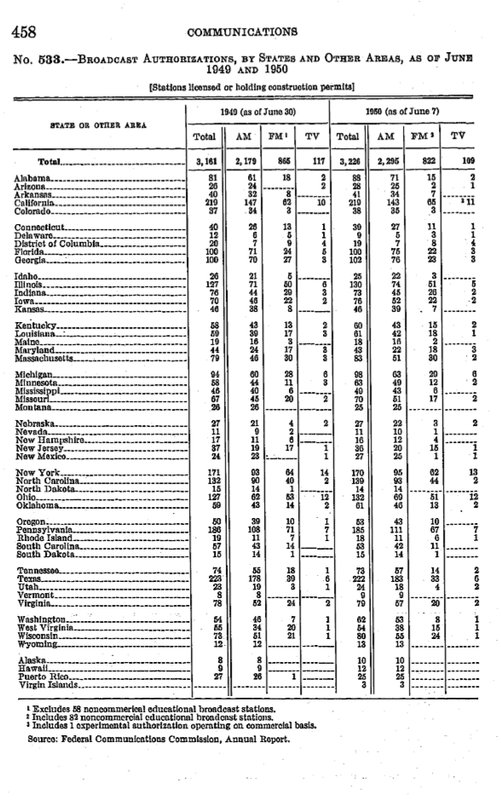 The 1951 Statistical Abstract shows that when KRLD-TV signed on, 15 of the 48 States still had no TV stations. 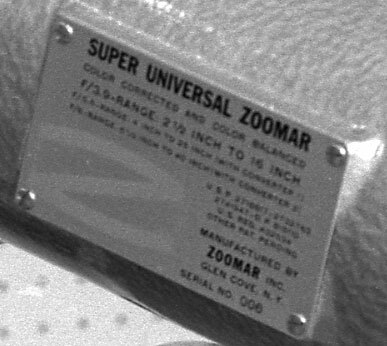 Naturally you're wondering about the antenna specifications, so I should mention that the antenna was made by General Electric, like almost everything else in the station. 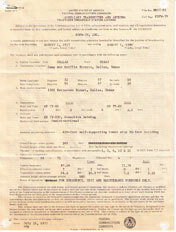 Further details are available on the license, which the station maintained until 1980. (A long time ago, I heard that the downtown transmitter was tested every Wednesday night after sign-off, just to see if it still worked.) The transmitting antenna was removed years ago (about 1995) to reduce the load on the tower, and the original transmitter was scrapped several years earlier, around 1984. 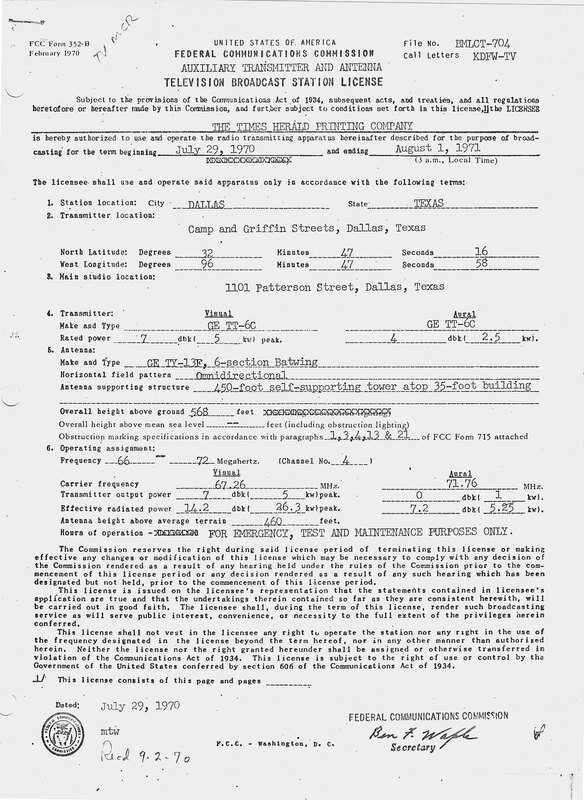 The license is 29 years old and somewhat discolored with age, and if you "click to enlarge", it's 2.37 Megabytes, but this is one of the clearest scans of a 29-year-old station license you'll find online, if I may be so assertive. In the corners, you can see where the thumbtacks were. This is an even older license for the auxiliary (downtown) transmitter. 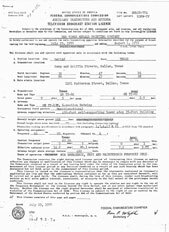 This license was valid for the one-year period ending August 1, 1971. 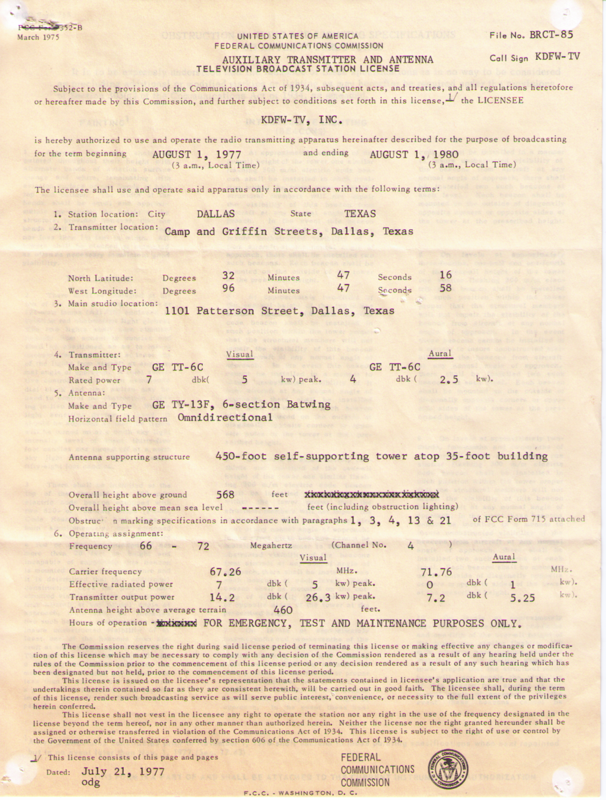 Like every other FCC license issued in the late 1960s and early 1970s, this one was signed by Ben F. Waple. Royce called a few days ago to say that he has really enjoyed seeing the photos on this page. At the moment that he called, I was doing the same job in the same room, about 40 years after this picture was taken. But the job was much more difficult back then. 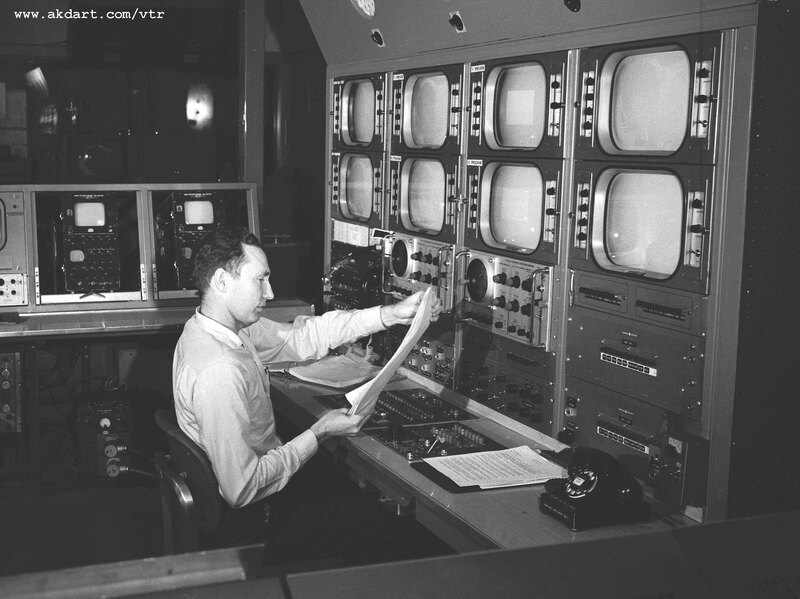 TV stations ran far fewer commercials per hour, but the Master Control engineer had to roll and switch and log every commercial break manually, and back-time movies without a calculator. There was nothing automatic about it. I think the tags on the phone say "DO NOT USE THIS PHONE"
The phone number apparently starts with "RIverside 4-" (or 7-) but the rest is unclear. 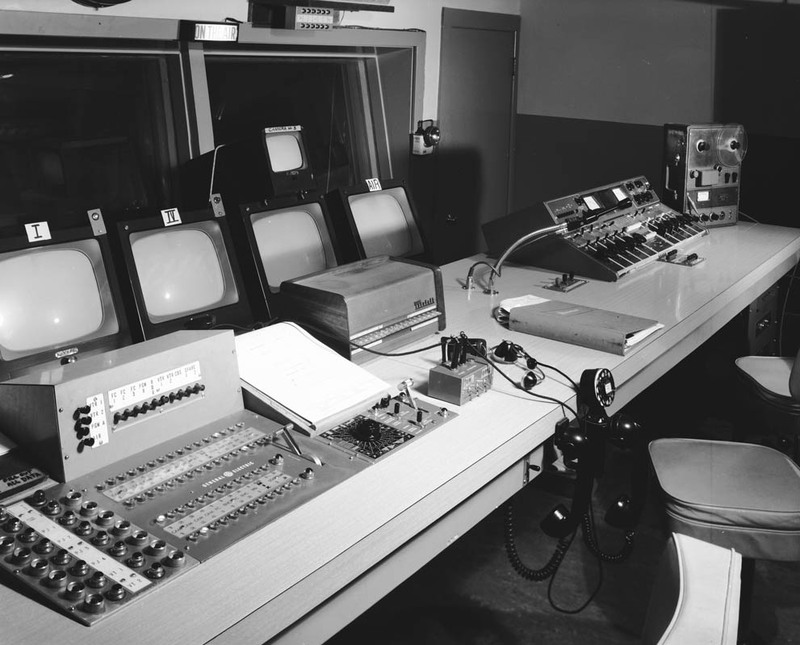 This is the Studio A control room, sometime in the 1960's. 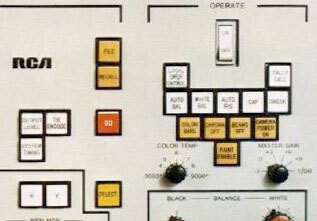 The video switcher and the audio board were both made by General Electric. 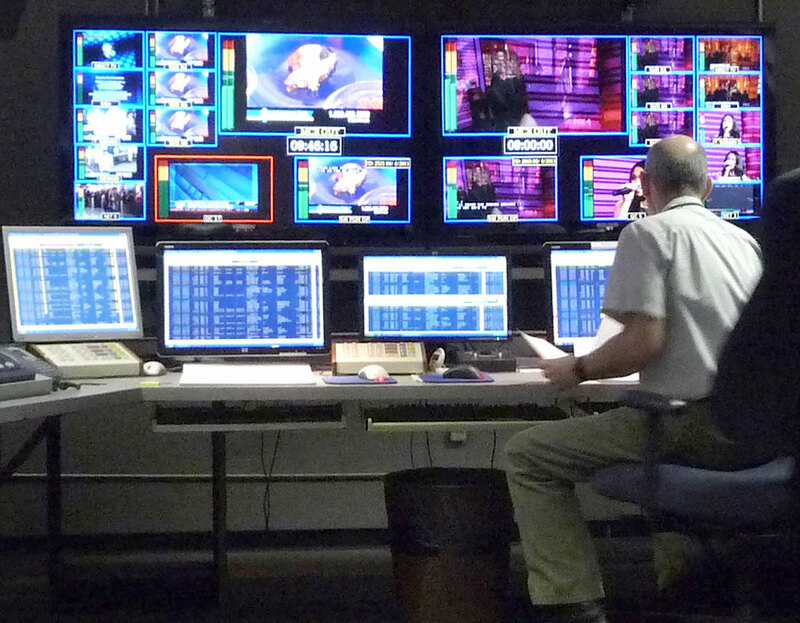 Looks like the same video switcher that was in the Master Control room. 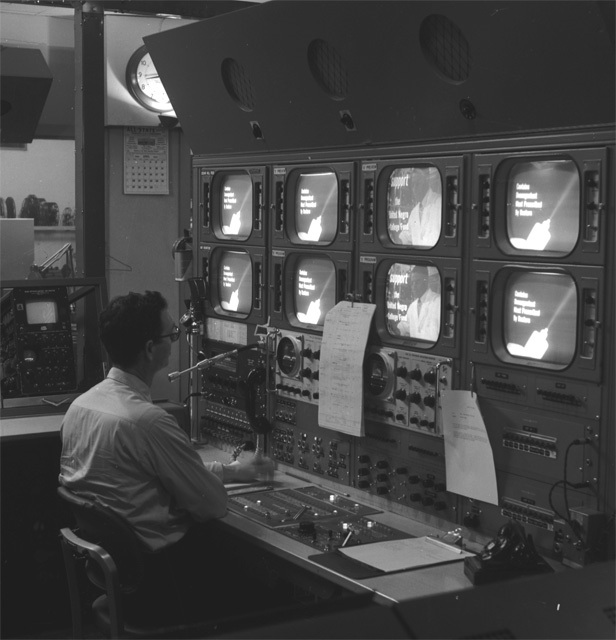 Video switchers today are somewhat more complicated. Here's the old audio booth. 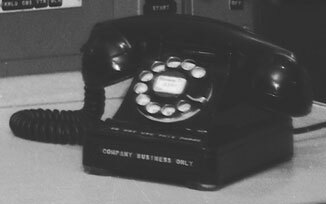 That gooseneck lamp next to the audio board (or one exactly like it) is still in use today in the Master Control room. It appears that the video monitor is behind the glass, in the next room. How strange! 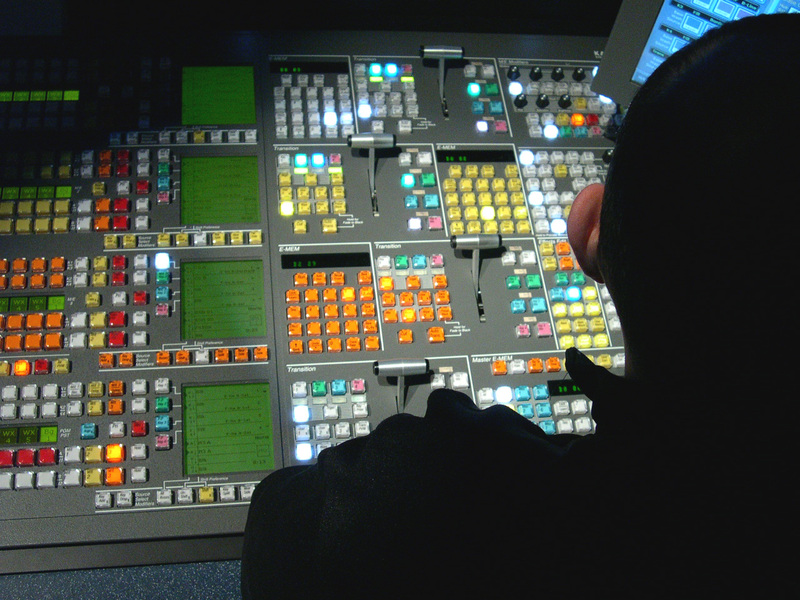 Seems to be a Collins audio cart machine to the left of the audio engineer. 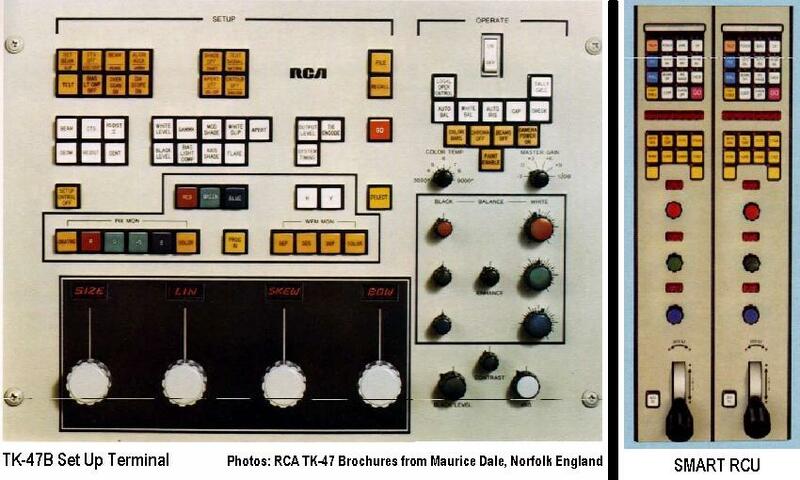 And that's a Collins audio board, if I'm not mistaken. 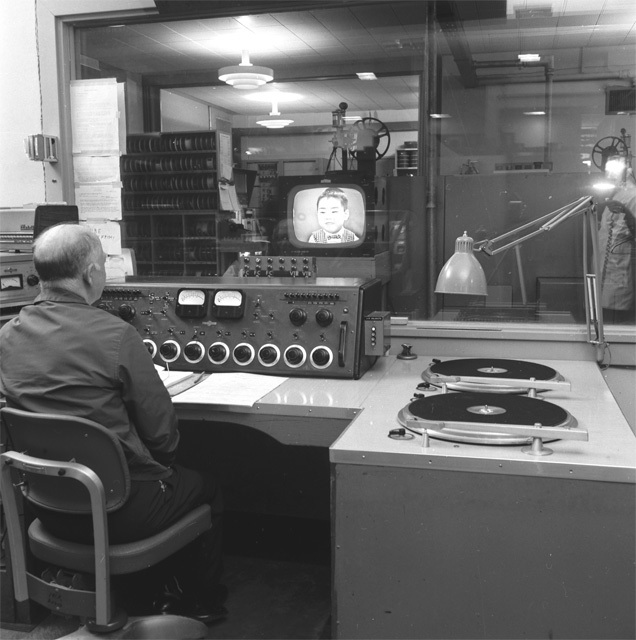 And the audio engineer is apparently watching Art Linkletter's House Party on a DuMont monitor. 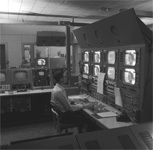 The calendar in this picture, just above the operator's head, shows April 1964. This was back when Sundays were shown in red. Another view of the Master Control room and the projection room behind it. But I don't know who the operator is. This man has been identified as KRLD-TV "Old timer" Charley Dobkins. The person making the positive I.D. is Charley himself! He appears in this picture and the one directly above. Tony Santos, who was working at KRLD-TV (or was at least thinking about it) by the time I was born, says this is not Buck Talley, as I had guessed, but another gentleman whose name he couldn't remember off the top of his head. But Tony says this guy was as strong as an ox, and could carry one of these heavy old cameras by himself. After thinking about it for a few days, Tony says the man in this picture is Roland Gregory. The man on the right is believed to be Ken Hansen. The other fellow has not yet been identified. 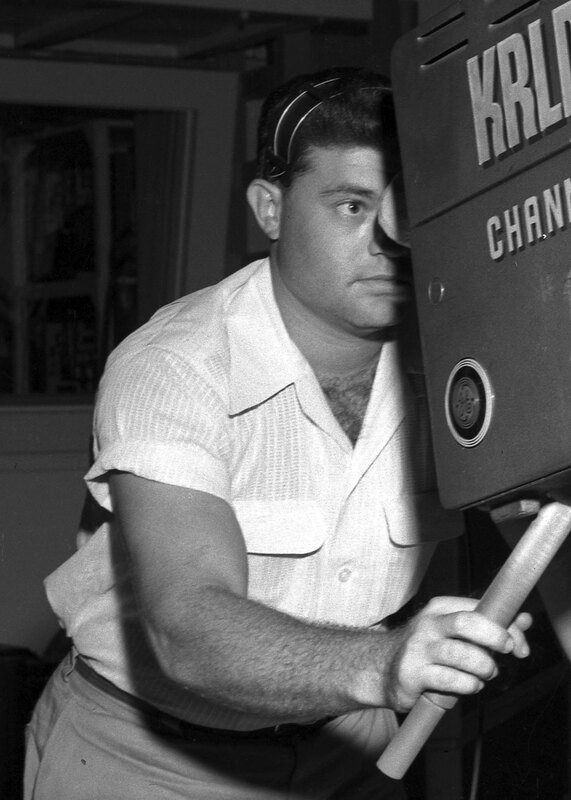 Charley Dobkins wrote and identified the other fellow as a film developing expert named Jim Dungan. See Charley's collection of photos here. 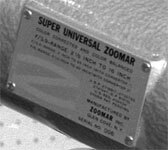 Hey, isn't that a Super Universal Zoomar? 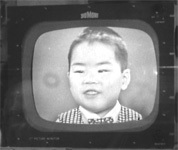 And a Teleprompter Model V? Elsewhere on the internet, you may occasionally run across other old photos from KDFW, although they seem to be rare. Recently I discovered this photo at a web site that specializes in old cameras, not personalities. The news people in this photo are -- if I am not mistaken -- Wayne Shattuck, Clarice Tinsley, Barry Judge, and an unidentified sports announcer. The three camera men are (from left to right) Bob Jacobs, Gene Paszalek and Gene Dimock. As always, correct me if I'm wrong. 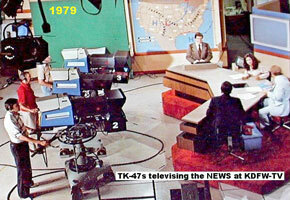 KDFW was one of the first stations to acquire the fabulous RCA TK-47 studio cameras in 1979. 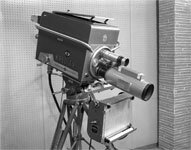 They were the third generation of new cameras at the station, I believe, and with each new generation, the picture gets about ten times better. 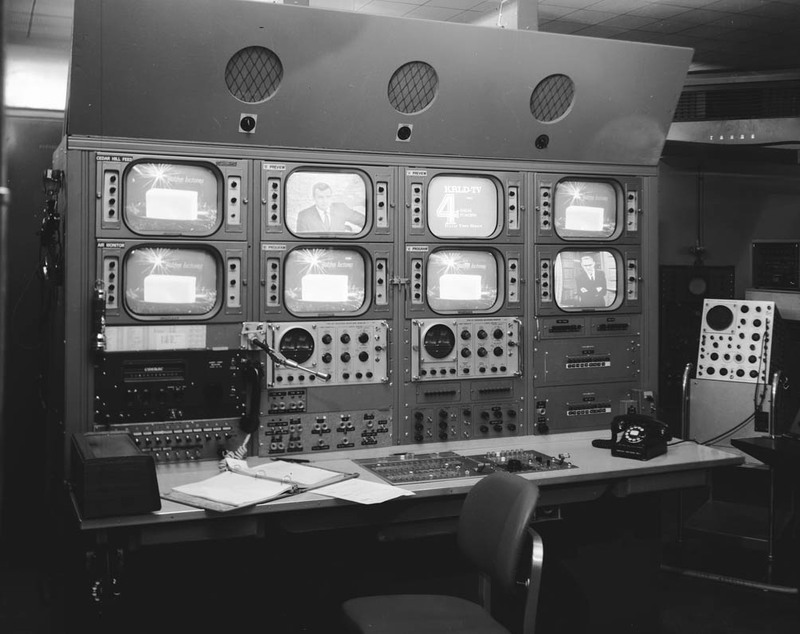 If you really like old television broadcast equipment -- and who doesn't? -- you should spend at least an hour exploring Barry Mishkind's excellent site. 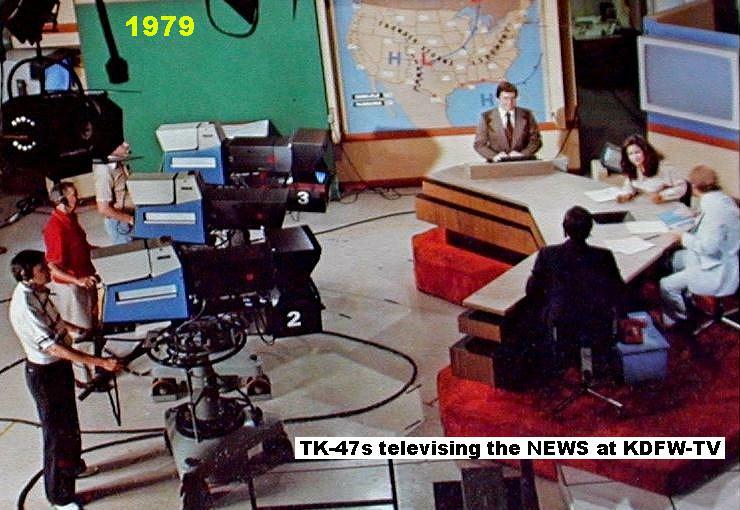 The TK-47s were replaced by Sony CCD cameras, which were excellent cameras, but even they were replaced by a new generation of Sony high-definition cameras. 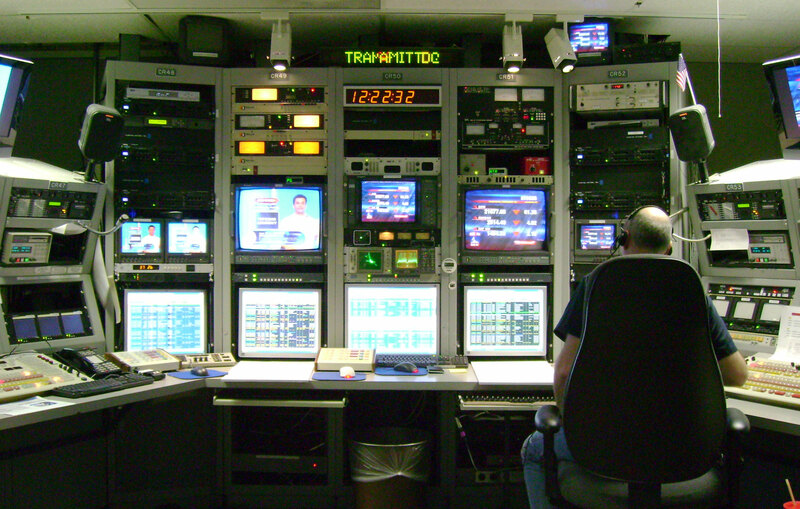 The pictures on the air are very impressive, especially considering how little time is spent on technical adjustments. The lighting never changes, so the studio cameras get an automatic white balance once a day (maybe), and that's it! 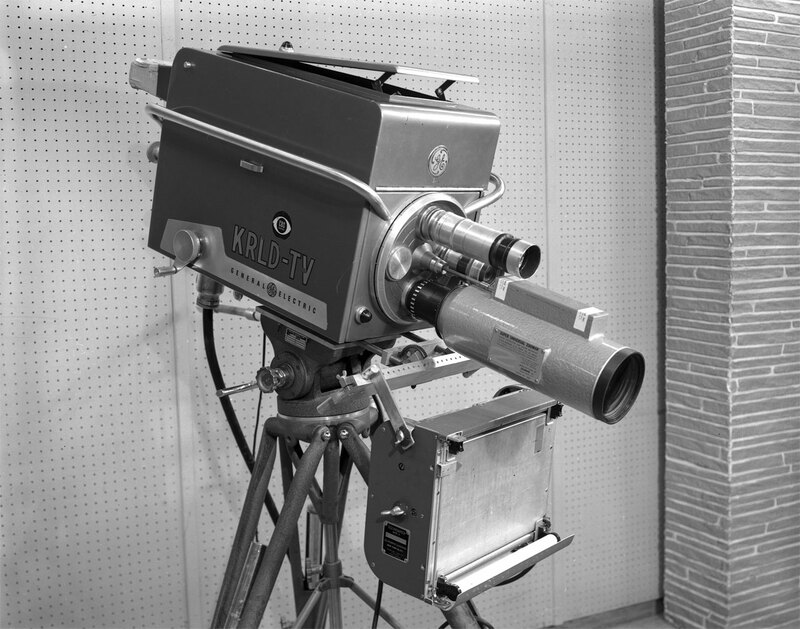 The RCA cameras were among the first studio cameras to feature computer-assisted setup. You could replace a tube or change the length of the cable or do something else to disturb the camera, and then -- instead of having to spend half an hour adjusting every little aspect of the picture -- just push the Auto-Setup (red) button and in about five minutes the camera was ready to go on the air. Some additional fine-tuning could make improvements, but the automatic setup was pretty good. There was also a shorter setup routine called "Check" which was used much more often. 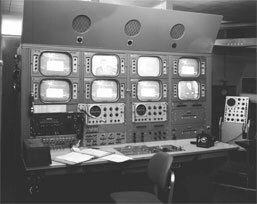 Another peculiar thing about these cameras was that (at KDFW) the "master gain" was always set to minus 3 dB, to reduce the video noise. This required more light in the studio, but light was plentiful and cheap.